The above chart shows how Transcendental Meditation reduces blood pressure more than standard medical protocols. In a clinical experiment with elderly African Americans (mean age 66) dwelling in an inner-city community, Transcendental Meditation was compared with the most widely used method of producing physiological relaxation. Subjects who had moderately elevated blood pressure levels were randomly assigned Transcendental Meditation, Progressive Muscle Relaxation (PMR), or usual care. 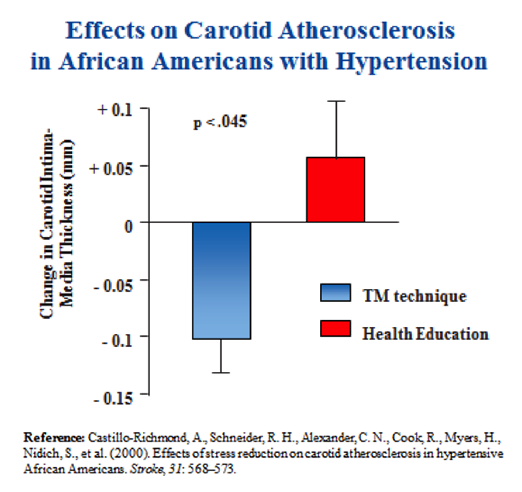 An April 2013 report by the AHA concluded that the Transcendental Meditation technique lowers blood pressure and recommends that the TM technique be considered in clinical practice for the prevention and treatment of hypertension. The report stated that there is not enough scientific evidence to recommend any other meditation or relaxation technique.